After missing his rookie season with a broken left ankle, Baltimore Ravens defensive end Bronson Kaufusi is in the midst of a battle for a starting job, according to BaltimoreRavens.com. 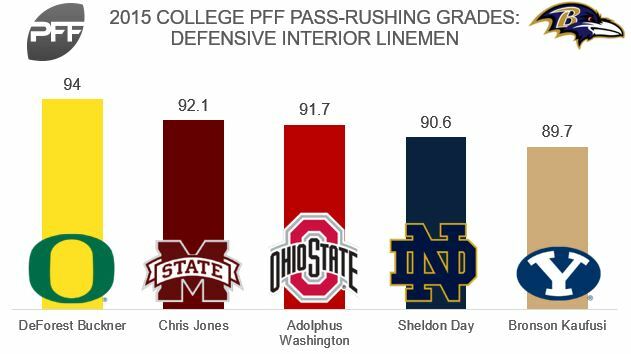 The former third-round pick was one of the most productive interior defensive linemen in the FBS in 2015. He ranked second among 3-4 defensive ends that season with 57 total pressures, while garnishing a position-best 13.2 pass-rushing productivity rating (measure of pressure created on a per-snap basis weighted toward sacks). His PFF pass-rushing grade of 89.7 ranked fifth among interior defensive linemen. Bronson was also dominant against the run. His 12.1 run-stop percentage was tied for the third-highest among interior defensive linemen that year.